I am friends with a chef. I real professional chef who directs and staffs and manages a HUGE professional kitchen. I have no idea how many people they serve everyday, but I do know he works crazy hard, makes amazing food, and he's willing to teach me something new every time we hang out - cheers to you Tom! On top of all of this, he's married to a dear friend of mine who's been adding love and joy to my world for 23 years! Last time we had a weekend together he taught us Beer Can Chicken - this is hands down my favorite way to make a chicken. We've cooked this chicken in our smoker, and baked it in the oven. It's moist, delicious and super easy. 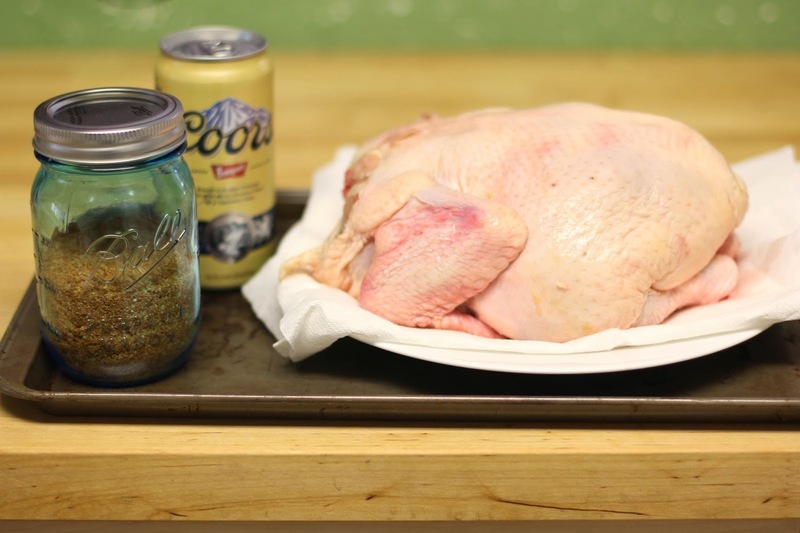 The second recipe is a great way to use up the extra bits of Beer Can Chicken. I love spicy salads, (Lettuce Wrap Salad and this Mango Chilli Chicken Salad are some favorites!) and this is a great new one for our rotation. Like a lot of my recipes, I upped the veggies. 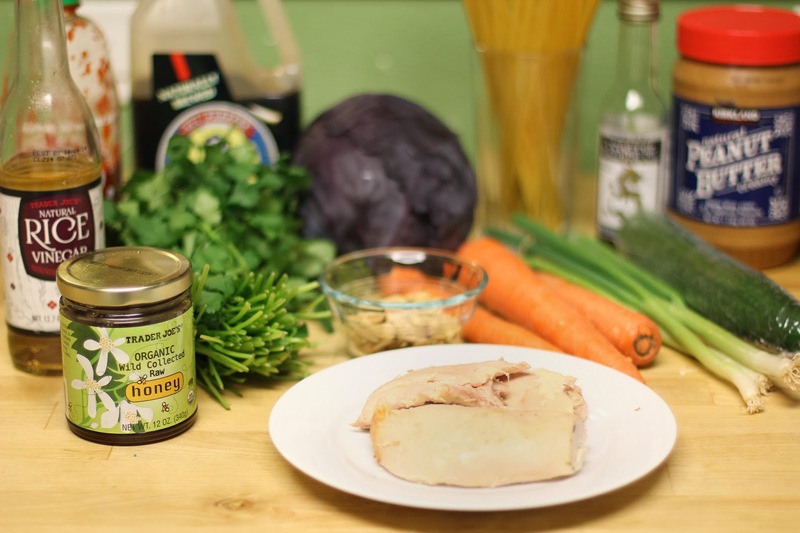 In this particular recipe I decreased some of the oil used in the dressing. Pat dry the chicken, remove the neck and organs and rub it all over with your favorite dry rub. My dear chef friend made ours, it is smoky a little sweet, tangy with a little kick of spice. We are so lucky!! 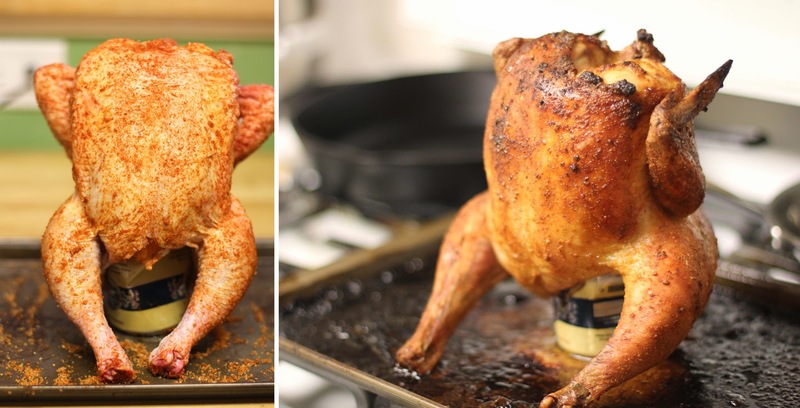 Drink half a beer and place the can in the cavity of the chicken. The bird needs to stand up on the beer can. Bend the can a bit if needed. Place the bird and can on the foil lined baking dish. Bake at 350 until the thickest part registers 165 degrees. About an hour and 15 minutes. We baked this chicken specifically to use shredded. Sunday night we made pizzas and this was part of a BBQ Chicken Pizza. Monday I made a green salad for lunch and topped it with some chicken. 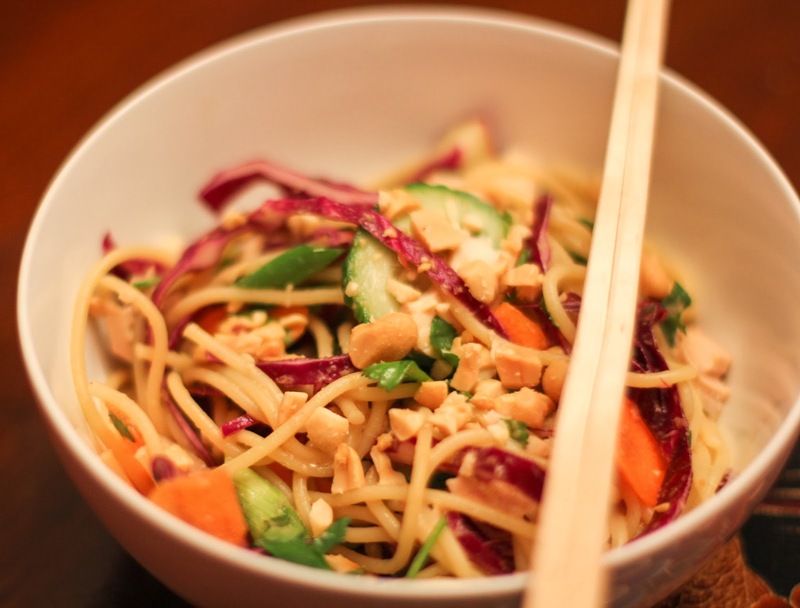 Monday night we made the Sweet and Spicy Peanut Noodle Salad with a bit more of this chicken. This salad is SO good! Sriracha - to taste. We added ours on top of the salad servings since we were sharing with our toddler. Start a pot of water to boil for the noodles and start in on the dressing. In a very large bowl, whisk all of the dressing ingredients until smooth. We added the Sriracha later to keep the dressing mild so our toddler would eat it. Next chop all of the veggies. I used a mandolin to thinly slice the cucumbers and carrots. Grating them would be just as easy and just as nice. When the noodles are done, rinse in very cold water and toss with the dressing. Add in the veggies and toss until everything is nicely coated in dressing and nicely mixed up. 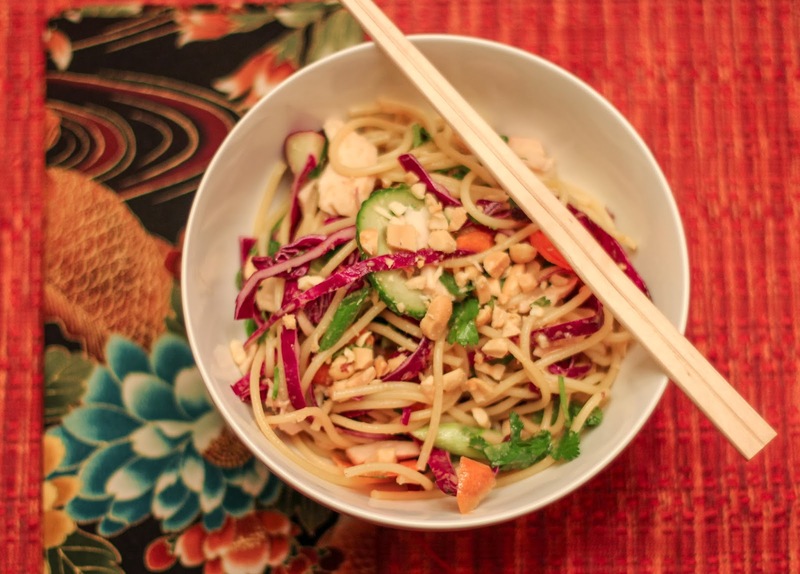 Serve in bowls and top with chopped peanuts, more cilantro and some Sriracha.